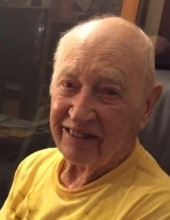 Wilmer G. Brinkman, 94, of Sterling, died Saturday morning, December 1, 2018 at a Lincoln hospital. He was born on October 7, 1924 at rural Sterling and attended country school. He married Maud Parrish on July 25, 1948 at the Methodist Church in Tecumseh and was a long time Sterling farmer. He was a life long member of St. John’s Lutheran Church in Sterling where he had served on the church council. He also was a former member of the Sterling School Board. He enjoyed his family, fishing, and farming, was a Husker fan, and liked to go camping and travel. Survivors include his wife Maud of Sterling; two sons, Norman (Kathy) Brinkman of Sterling Heights, MI and Marvin (Vicki) Brinkman of Lincoln; six grandchildren; seven great-grandchildren; three sisters-in-law, Faye Brinkman, Barb Miller, and Mildred Carman all of Lincoln; brother-in-law, Richard (Rita) Parrish of Tecumseh; nieces and nephews. He was preceded in death by his parents, George and Lena Weber Brinkman; two sons, Wayne (1997) and David (1999); two brothers, Donald and Melvin; three sisters, Bernice Stout, Leona Wolters, and infant sister, Clarice; parents-in-law, Newton and Edna Parrish. Funeral services will be held at 10:30 A.M. on Tuesday, December 4, 2018 at St. John’s Lutheran Church in Sterling with Pastor Dennis Reich officiating. Burial will be at the North St. John Lutheran Cemetery of rural Sterling. A family prayer service will be held at 10:15 A.M. Tuesday in the fellowship room at the church. The body will lie in state at the Zink-Fox Funeral Home on Monday from noon until 8:00 P.M. The family will meet relatives and friends on Monday from 5:00 P.M. until 7:00 P.M. at the funeral home. A memorial has been established to the family’s choice. www.foxfuneralhome.net Zink-Fox Funeral Home of Sterling is in charge of the arrangements. To send flowers or a remembrance gift to the family of Wilmer G Brinkman, please visit our Tribute Store. "Email Address" would like to share the life celebration of Wilmer G Brinkman. Click on the "link" to go to share a favorite memory or leave a condolence message for the family.